What does it mean, and why is it good practice? Floating the pin is the opposite of a shooter’s rational train of thought (which is trying to hold the pin rock steady throughout the shot). Instead of fighting the movement your muscles create – and they will move – allowing the pin to float slightly around the aiming point relaxes you more, allows for better focus on the target and better follow through. We are not machines. Our muscles exhaust, our nerves twitch. It’s impossible to hold the pin rock steady on the target. The trick is not to try. When we are chasing the pin around the target, we are focusing on the pin and often think that if the pin drifts off the target, that is why we miss badly. The truth is, it’s not that the pin moved that much, it’s the reaction to trying to hold the pin right on the target that caused the arrow to stray. There is a tendency to punch the trigger as soon as the pin is right on the target. The pin is held on the target, and you rush off the shot and punch the trigger. You are anticipating the shot, instead of using a smooth fluid motion to squeeze the trigger, which allows you to follow through naturally. Also, there is a philosophy around the 3D-target and bowhunting community that suggests if we cover up the target – a hair on a whitetail, a small circle on a target, whatever it may be – we subconsciously move our pin out of the way during the release and shot so we can see our arrow hit its mark. Either of these bad habits will reek havoc on your groups. Staying relaxed and confident during the aiming process will help your groups. 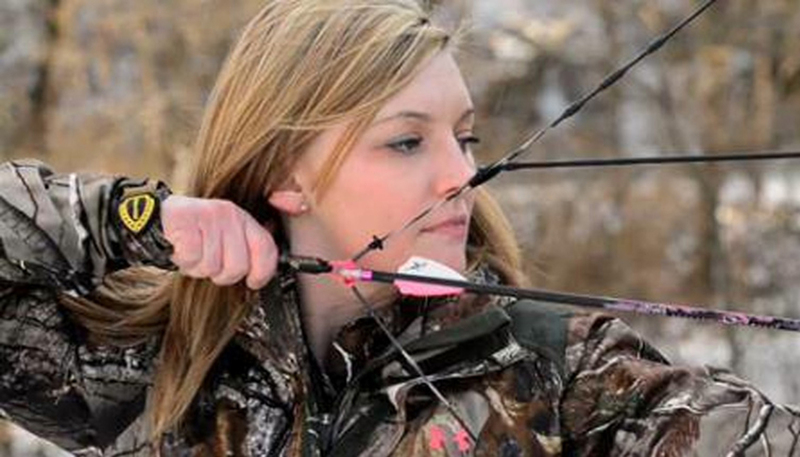 You heard the saying, “aim small, miss small.” That’s absolutely true as long as you allow the pin to float slightly around the hair of a whitetail or the center of the “X” on a target. It’s almost like magic, and in the woods, we can use a trick or two. This week, float the pin and be amazed how much your groups tighten up. Note: We won’t sight in our bows for another 2 weeks, so don’t judge your accuracy on where it hit the target. Judge it on the closeness of the arrows you do shoot aiming at the same target. Next week we take a look at some more form issues, so we can sight-in with the right mechanics.